The Waltham Watch Company, also known as the American Waltham Watch Co. and the American Watch Co., produced about 40 million watches, clocks, speedometers, compasses, time fuses, and other precision instruments between 1850 and 1957. 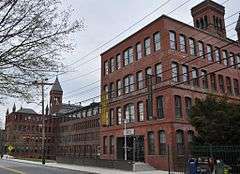 The company's historic manufacturing facilities in Waltham, Massachusetts have been preserved as the American Waltham Watch Company Historic District. In 1850, at Roxbury, Massachusetts, David Davis, Edward Howard, and Aaron Lufkin Dennison formed the company that would later become the Waltham Watch Company. Their revolutionary business plan was to manufacture the movement parts of watches so precisely that they would become fully interchangeable. Based upon the experience of earlier failed trials, Howard and Dennison eventually perfected and patented their precision watch making machines, creating what has been called the American System of Watch Manufacturing. The original name of the company, which began operations in 1851, is unclear. Some sources say the name was the "American Horologe Company." However, in 1886, Dennison stated that the first company name was the Warren Manufacturing Company, named for General Warren of Roxbury, a famous soldier of the War of Independence. The word "watch" was specifically omitted to retain secrecy of the novel operation. In 1851, production began in a new factory building. In late 1852, the first watches were complete. The first 17 watches, which ran for 8 days, and were marked "Howard, Davis & Dennison," were distributed among company officials. Number 1, given to Howard, is now at the Smithsonian Institution. Numbers 18 to 100 were named "Warren, Boston" and the following 800 "Samuel Curtis," after the financial backer of the company. A few, marked "Fellows & Schell," sold for $40. January 1853 saw the introduction of the "P.S. Bartlett" watch, named for early employee Patten Sargeant Bartlett. In September 1853 the company was renamed the Boston Watch Company. 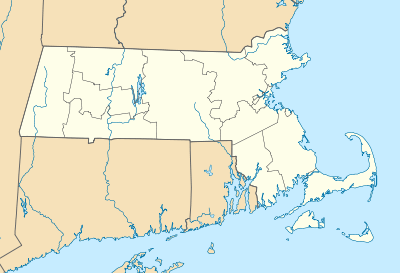 A new factory was built in Waltham, Massachusetts, on the banks of the Charles River, which was subsequently greatly expanded. In October 1854 the company moved into the new factory. These buildings of the factory were added to the National Register of Historic Places in 1989. The next movements manufactured (1001-5000) were marked "Dennison, Howard, & Davis", "P.S.Bartlett", and "C.T. Parker". The company had financial difficulties and Howard left to form E. Howard & Co. Upon bankruptcy, the company was sold at auction to Royal E. Robbins, who reorganized it under the new name Appleton Tracy & Company (ATCo) in May 1857. The next movements produced, Serial numbers 5001 to 14,000, were used in the Waltham Model 1857 watch, the first pocket watch produced in America of standard parts. The "C.T. Parker" was introduced as the 1857 model. 399 units were made. Also 598 chronometers were manufactured. 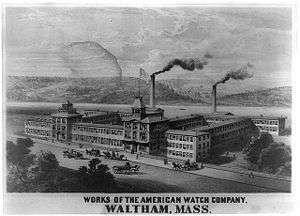 In January 1859 the Waltham Improvement Company merged with Appleton, Tracy & Company, forming the American Watch Company (AWCo). In 1861, as the country entered the American Civil War, production stopped. The company decided to downsize to the lowest possible level to keep the factory open, which was successful. After the Civil War, the company became the main supplier of railroad chronometers to various railroads in North America and more than fifty other countries. In 1876, the company showed off the first automatic screw making machinery and obtained the first Gold Medal in a watch precision contest at the Philadelphia Centennial Exposition. In 1885 the company name changed to the American Waltham Watch Company (AWWCo). 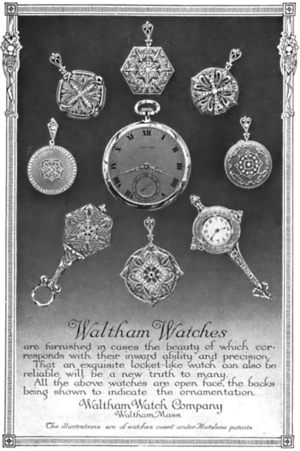 In 1907 the company name changed to Waltham Watch Co. (WWCo), in 1923 briefly to the Waltham Watch and Clock Company and finally in 1925 to the Waltham Watch Company (WWC). Waltham model 1899 pocketwatch movement. Two high-quality groups of watches were produced by the company for orders placed by the Canadian Pacific Railway. One large group has the shield and beaver emblem of the Railway engraved on the movements, and is known as the "CPR" type. The second group has "Canadian Railway Time Service" engraved on the movements, and is known as the "CRTS" type. They are both highly prized by collectors. Every watch movement that the company produced was engraved with an individual serial number. That number can be used to estimate the date of production. Volunteers have created a database of Waltham serial numbers, models and grades, and descriptions of observed watches. The company closed its factory doors and declared bankruptcy in 1949, although the factory briefly reopened a few times, primarily to finish and case existing watch inventory for sale. Several different plans were presented to restart the business, but all failed for various reasons. In 1958, the company got out of the consumer watch business completely, and reorganized into the Waltham Precision Instruments Company. All remaining watch inventory had been sold to the Hallmark Watch Company the previous year, and rights to the "Waltham" trademark were sold to a new Waltham Watch Company incorporated in Delaware in exchange for stock. Specialized clocks and chronographs for use in aircraft control panels continued to be made in the Waltham factory by the Waltham Precision Instruments Company until the company was sold in 1994. The company is now based in Alabama, as the Waltham Aircraft Clock Corporation. Before the Waltham Watch Company went out of business in 1957, it founded a subsidiary in Switzerland in 1954, Waltham International SA. Waltham International SA retains the right to the Waltham trade name outside of North America, and continues to produce mechanical wrist watches and mechanical pocket watches under the "Waltham" brand. During their restructuring efforts in the 1950s, Waltham opened an office in New York for the purposes of importing Swiss watch movements and cases. Due to restrictions placed on the company by its main creditor, the Restructuring Finance Corporation, they could not sell these watches directly, so they were sold through an independent company, the Hallmark Watch Company. The Waltham Watch Company (later known as Waltham of Chicago) was founded by one of the executives of the Hallmark Watch Company to carry on the Waltham trade name in the watch business. In exchange for rights to the name, existing Waltham Watch Company (Mass) shareholders received 1 share of the new company for every 5 shares of the original company. In 1959, the Waltham Watch Company merged with the Hallmark Watch Company, giving the new company access to replacement parts to service existing Waltham watch owners. 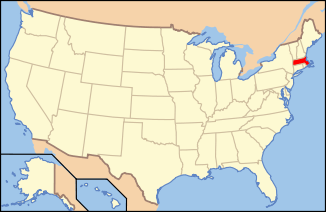 The company came under much scrutiny by the Federal Trade Commission throughout the 1960s, and ultimately was forced to change its advertising and branding policies to clearly indicate that it was not directly related to the original Waltham company, and that its products were not made in America. Waltham International SA manufactures and distributes Waltham Swiss Made watches in the luxury watch market. After a period when the sales has been concentrated in the Japanese market, since 2011 the majority of the company has been taken by the American entrepreneur Antonio DiBenedetto. In February 1994, Prime Time Clocks purchased the last remaining product line, the mechanical aircraft clock, was purchased from Waltham Precision Instruments and moved to Ozark, Alabama. The company then incorporated in the state of Alabama under the name of Waltham Aircraft Clock Corporation. Upon giving the Gettysburg Address in 1863, Abraham Lincoln was presented with a William Ellery, key wind watch Waltham Model 1857, serial number 67613. This watch is now in the collection of the National Museum of American History at the Smithsonian Institution in Washington, DC. The 1937 Ford sedans had Waltham speedometers, reputedly the only speedometer in a Ford to display the name of its manufacturers. A testor at the time was quoted as saying that accuracy had to be "plus or minus 10 MPH". In early 1962, Massachusetts Institute of Technology (MIT) engineers began work on the Apollo navigation system. The engineers' starting point was MIT's revolutionary guidance system, which included gyroscopes and instruments for measuring changes in direction. The guidance system was high mechanical technology, like the precision parts in a watch. MIT. engineers, students and staff, led by Dr. Charles Stark Draper, worked closely with the Waltham Watch Company. The MIT team learned how to work with high precision machining while under the operation and direction of military contractor Raytheon Space and Information Systems Division Waltham Operations. Mechanical gyroscopes, spinning with ever-higher precision, very low friction, and very low wear, required the utmost accuracy and absence of even the most minute defect. Nobody had ever tried to manufacture precision instruments that would work with such accuracy before the Waltham team. It is said that the hygiene and cleanliness rules of the team were so strict that women were not allowed to wear makeup and if someone had just come back from a sunny vacation, they were forbidden to work near the assembly area for fear that they could have skin flaking off from their suntans. In 1996, astronaut David Scott, commander of the Apollo 15 mission in 1971, stated that he wore a Waltham watch on his third lunar EVA when his standard Omega Speedmaster Professional chronograph became damaged. In 2014, he confessed that he had made a mistake - "it was a Bulova, not a Waltham." Edward A. Marsh (1896), The evolution of automatic machinery as applied to the manufacture of watches at Waltham, Mass., by the American Waltham Watch Co., Chicago: G. K. Hazlitt & co.
↑ "Waltham Precision Instruments vs Federal Trade Commission". OpenJurist. Retrieved 2010-07-16. 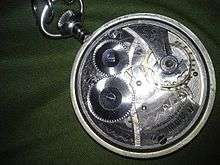 ↑ "Abraham Lincolns Waltham Pocket Watch". Antique Time. Retrieved 2009-10-28. ↑ "Apollo navigation system". Archived from the original on May 10, 2012.